Harry and I actually walked this afternoon in sweatshirts, and I warmed up enough to take mine off for our last two laps. I think our high this afternoon was in the low 60s. All around the neighborhood, people were out decorating their houses and working around their yards. Everyone was remarking on the weather, and saying, “we’ll take a few more weeks of this.” Well, I don’t know if that will happen, but I certainly won’t be complaining about it if it does! We had another great weekend for getting things accomplished around here. Yesterday we did some more cleaning out, some more pitching. Harry’s sister and brother-in-law stopped by, and we gave them a tour of the fiver. I meant to take pictures, but in the busy-ness of chatting and catching up, I forgot! I love Sundays, especially when football is on! While we were watching some football, Harry and I enjoyed a nice little afternoon snack, some cream cheese and red pepper jelly on crackers. While I was listening to the football game, I was working on Christmas cards!! We only send about 40 of them, but still, I am usually sending them out around, oh…the third week of December. I usually consider it a great year if I get them out before Christmas. This year they will be going out – tomorrow! Yes, they are DONE! Now I am done for the day, and ready to relax with my kindle. Supper is cooking in the roaster oven. It’s time to hang out and enjoy the rest of the day. I hope everyone had a very nice Thanksgiving holiday. Ours was very nice. It started out with sleeping a little later than usual. That was only a little after 7 am, but still, compared to our normal 5:30, it was a great start to the day! Of course, the little guy was going strong, so on top of conversation, we also had “playtime” breaks. It was great to be able to relax, and sit around just chatting and spending time with family. As usual, there was a lot of good food, and we all ate a bit too much. All too soon, it was time to think about heading home. Unfortunately, both of us have to go to work today. No black Friday shopping excursions for us. It was just starting to get dark as we were getting on the road for home, but you can still see what a beautiful day we had! And for much of our trip home, we were able to watch an all-natural light show. It was just an all-around great day! Wishing you all a happy and blessed Thanksgiving! Wherever you find yourselves today, may your day be filled with love, laughter, good weather, and an abundance of good food!! Today we had another early start, but it was nice not to be heading to work. We packed our suitcase this morning, with Ariel hanging around and climbing into the bag when our backs were turned. Hopefully one night away won’t be so traumatic. In October when we went on vacation, she was attached to me for about 2 weeks after we got home. After we got ourselves organized and the car packed, we headed off to Albany to pick up a couple pies at Grandma’s. Grandma’s is a well-known local restaurant in the area, serving home-style food and all kinds of yummy pies for dessert. But a few times a year, around the holidays, they shut down the restaurant entirely and just turn into a yummy pie factory. No, that’s not a traffic stop up ahead. That’s a police car preparing to assist the traffic coming in and out of Grandma’s all day. I took this picture quickly as I was standing in line waiting to pay for my pies. Sorry, it’s a little out of focus. They are very organized, and we were in and out very quickly. Then we headed off toward MA. It was a dreary day, but it could have been worse. We stopped behind this car on our way out of Albany. We were also lucky that we were heading toward Boston, because the traffic in the other direction was much heavier. We took Schaun to his first movie this afternoon. We didn’t stay for the entire movie, but it was fun for awhile. I think Schaun’s favorite part might have been the pretzel he shared with Papa beforehand. After our visit with Gretchen and Schaun, we are now relaxing in our hotel room for the evening. Ahhh! Today was another nice November day, warm with a high in the 60s. This can keep up as long as it wants as far as I’m concerned! My sister Denise and I headed out this morning to a local craft fair, while the “hubbies” stayed at our house with the kids. We found a few things, but I didn’t take any pictures for the blog, on the off chance that a recipient of said item might see their gift prematurely. After a couple hours at the craft fair, we ordered a pizza at a local shop and headed home. In the meantime, the kids were having a good time at the playground at a nearby school. It was nice to sit around, enjoying conversation and just relaxing on a Sunday afternoon with some football playing on the tv in the background. Hannah was enjoying a puzzle game that Harry and I bought recently so we would have something new at the house for the kids to play. In other news, Harry was reading a thread today about rv ovens and distributing the heat more evenly. One of the suggestions was to place either a pizza stone or unglazed quarry tile on the bottom of the oven. We were talking about it and realized that we had a pizza stone out in the garage that we never use. So out we went! And, also we are finally heading down the home stretch in the office….the place where we have put all the miscellaneous junk we have moved out of all the rooms as we have worked on fixing them up. The blue box is shredding, and a couple of the other boxes contain stuff that is going, and we KNOW where it’s going. A couple of the plastic containers are going with us as storage. We are almost done in here!!! Yes, the time is moving right along. Next week is Thanksgiving already. And, I’ve even made some progress on my Christmas shopping. You’d think with all the time I spend planning that I would not be surprised that the holidays are already upon us. But it’s crept up on us quickly after all. This was the sky this morning. This is what we call a “snow sky” but thankfully, we are not getting any snow this morning. Although they are getting some not that far from here, to the west of Albany in the lake effect areas. There really hasn’t been much going on around here. The normal weekly stuff – going to work, coming home, having dinner, etc. – exciting huh? The type of cleanup we are doing these days is the low key kind. Every week before garbage pickup, we just throw in a few more things to take up any extra space. I find that the winter months are the hardest time to stay motivated. The grey skies and cold temps don’t energize me. By the time I come home from work, it is already dark. Even though we’re already planning some getaways for next year, and I know that we need to get stuff done NOW so we don’t have it all left to do next summer, it’s so tempting to look outside at the dreary view and say, I don’t feel like it, let’s wait and do it next week. Unfortunately “next week” too often turns into a repeat of the same. Well, there are four more weekends left to this year – we shall see how much we can accomplish. It’s been a busy few days. We had our little guy at the house until Sunday. His mom arrived on Saturday to spend the weekend as well. So it was very nice not to have to make the return trip back to MA. Yesterday it was back to work for another week…enough said about that. The weather continues to be very pleasant for this time of year. Halfway through November now, and we are only on our sixth bag of pellets for the season. This is the best start for the heating season that we have had since I have been in this house (which is for the past four years). Now that our company is gone and our relaxing weekend is over, I hope to get back to THE LIST, starting tomorrow! The time before the end of the year has decreased to only about six weeks left. And we continue to plan fun get-aways for next year’s camping season, which means we have to get crackin’! The next major item is the remodel of the upstairs bathroom. I read a very interesting blog this morning…entitled Talking vs. Doing. It really gave me some food for thought, and I considered the path that our journey has taken over the past couple of years. Two or three years ago, when Harry and I were making plans and starting our preps for hitting the road, it did seem like such a monumental undertaking, all of the house improvements that we wanted to do around here, and purchases that were yet to be made. 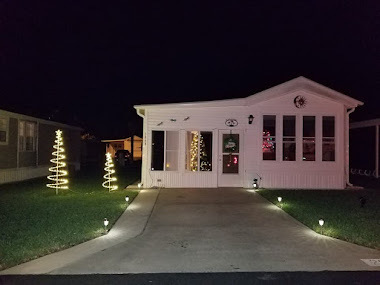 But now, the house remodels are winding down, the rv and truck have been acquired, and many of the “start-up” items on our list have been purchased. The tasks ahead are starting to seem more do-able, and the finish line is even starting to appear off in the distance. Harry and I are both so glad that we didn’t let the initial apprehensions we felt deter us from taking the first steps. Our home is home again! Even though it was a cloudy day, and cooler, it was nice enough so that the guys could come this morning and cut down the tree. We called the repair place and told them we would be coming to get the fiver this morning. We were so happy to pull into the parking lot and see her sitting right where we left her yesterday. It was a very quick process to head inside, fill out the requisite paperwork and pay the bill. We haven’t completely gotten the hang of getting her in the driveway, so it wasn’t a really pretty process. But hey, pretty process or not, she is back in her spot and looks great. Both Harry and I are so happy to have our fiver back. It sounds crazy, but we really missed seeing her sitting out there, even though it was only for one day. Harry took a picture of the area that they put the caulking on, but you can’t see it too well in the picture. We have some nicer days coming up over the next week, so he will try to get some better shots then. Today was the day. It has been about a week and a half since a tree branch collapsed during an early snow storm and hit the top of the fiver. So today was when we took a trip over to the repair place to leave the trailer to be looked at and repaired. Both Harry and I thought that today seemed like the easiest hitching up process we have done yet. Everything went very smoothly, and it only took us about a half hour to get everything together and head off down the road. Schaun was really great, and hung out in his car seat “reading” his books while we were busy hitching up the trailer. The repair shop was even closer than we were thinking it was – we were heading down the road at ten of ten and by quarter after ten, we were turning into the driveway. We dropped off the fiver, and stopped into the office to check in. We explained where the damage was, and were told that they would check it out either tomorrow, or maybe even this afternoon. Here is our big empty driveway, BUT it won’t be empty for long!! Because, shortly after we arrived home, they called from Dedrick’s. They had already evaluated the damage from the tree branch. They cleaned the areas, and found that some of the areas that appeared to be damaged were just rub marks from the tree branches. The owner recommended rather than using a repair kit, that Dicor self-leveling roof caulking be used, as it would blend in better than patches and would sufficiently repair the damage. So we gave them the go-ahead to do the repair, and a few hours later, we heard from them again – the repair was complete! We may go back tomorrow to pick up the fiver – it depends on the weather. If it is nice enough that the guys can come and take down the tree in the morning, then we will drive over in the afternoon and pick ‘er up. We are first on the schedule as long as it’s not raining, so we’re keeping our fingers crossed that the weather cooperates.